WASHINGTON, DC. (THECOUNT) — President Trump was so impressed with Tiger Woods‘ amazing performance at The Masters — he’s giving the golfer the Presidential Medal of Freedom, TMZ is reporting Monday. The Medal is the highest award that can be awarded to a civilian in the United States and has previous recipients include Michael Jordan, Kareem Abdul-Jabbar, Pope John Paul II, Bob Hope and more. 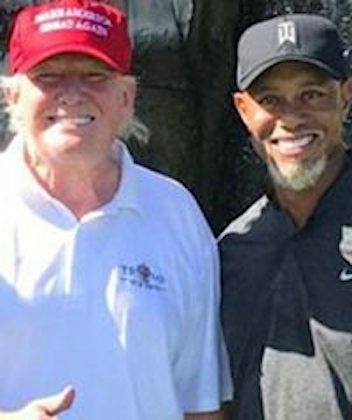 Trump and Tiger have been friends for years — Tiger recently golfed with the President back in February at Trump National Golf Club in Jupiter, Florida. Of course, Tiger’s victory wasn’t just impressive on its own — but is being hailed as one of the greatest professional comebacks in all of pro sports considering he hadn’t won a Major in over 10 years.